Garnets are a complex and exciting family of gemstones. 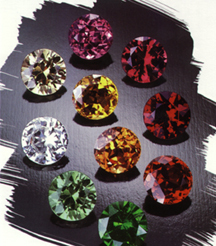 The Garnet family has six species and, like exotic flowers, these can naturally "hybridize" and form other varieties which cover a rainbow of hues, except blue. While Garnet is worn by many active people, to ensure the longevity of Garnet, remove before engaging in activities that can subject the gemstone to scratches and sharp blows, such as housework, gardening or sports, as well as extreme temperature changes. While today we are not limited by tradition, Garnet is treasured as a gift for January birthdays and a talisman for the sign of Aquarius. A Garnet of any color is associated with increased imagination and inspiration.